So we were in Tagaytay for the weekend and we dropped by Solenad 3 for lunch (more posts about Tagaytay and Solenad 3 meals). This one is about the churros that we had for dessert though. Churros, though part of Spanish eateries in most restaurants in Manila, they have recently been brought into the spotlight by La Lola Churros (which I haven’t tried actually). I have had an affair with churros and have always had them in my recipe list of things to perfect, and I have tried it repeatedly at home. But without much of a success without the star tip for the churros. The difference between American and Spanish churros.is that Americans are always huge and covered in cinnamon sugar or filled with bavarian cream. 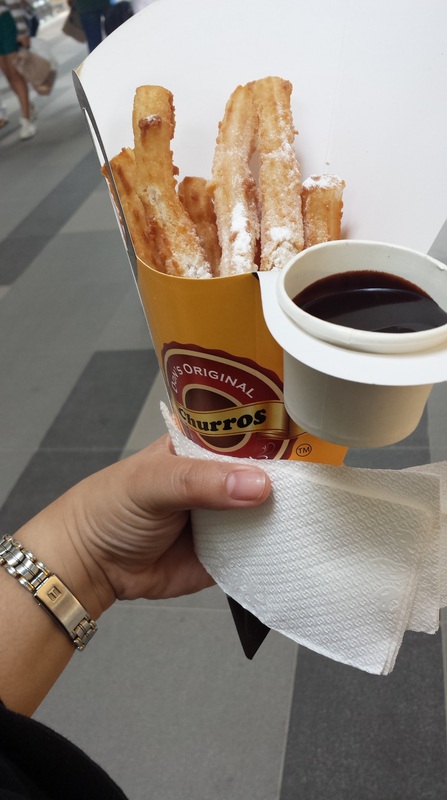 🙂 Spanish churros are sometimes smaller, served plain most of the time, and served with some spanish chocolate dip. So obviously, this one is the Spanish version. These were about 8 inch long pieces, about thumb width, and served with a chocolate dip. It came out to be about P80 I think, which is fairly cheap for such a good snack. 🙂 So was this the best? No, i don’t think so. But when you are craving for something fried and chocolatey, this is a really, really good dessert!